With a fantastic cast of characters and a story filled with humor and murder you won’t be able to put it down. I love these books because the whodunit isn’t all that obvious. Just when I think I’ve figured it out, a new wrench is thrown into the mix and I’m back to square one. 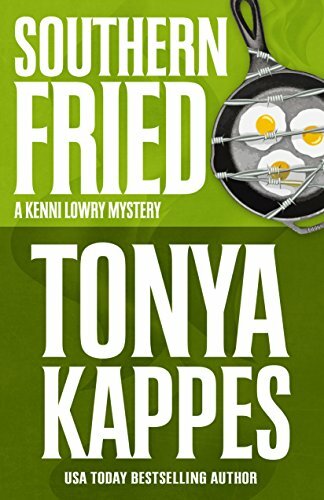 Full of Tonya’s sass and spirit, this series keeps up a strong pace and keeps Sheriff Kenni on her toes. It was a good solid mystery, the author kept me guessing and I like that. This book was a great cozy mystery that was set in a small town… I loved all the Southern Sayings. In a nut shell, if you like mysteries with a dash or two of southern charm and humor, you’ll enjoy this one. 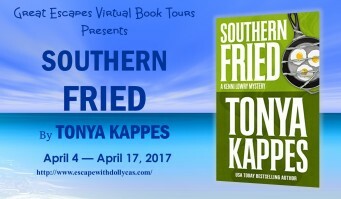 If there is one thing you count on in a book from Tonya Kappes, it’s a laugh out loud until you cry story filled with southern characters that are as eclectic as they come. SOUTHERN FRIED is written proof of that. One thing I really enjoyed about this book was that it was still light and humorous. Oh my heavens this is one funny book. The author has really gotten the southern lingo and charm down for her characters. I loved everything about this book including the delicious southern dishes that made my mouth water. The second Kenni Lowry mystery is another winner with an ending that’ll put your heart in your throat! 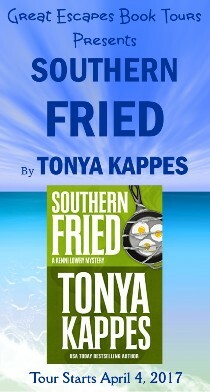 I call this another home run for author Tonya Kappes. A definite must-read for any cozy mystery fan! After the dead body of a beloved Cottonwood resident is found tangled up in an electric fence, Sheriff Kenni Lowry has a hunch that somethin’ ain’t right. Her investigation heats up with a fierce cook-off competition, a euchre game where the intel is sweeter than the brownies, and a decades old family recipe that may just be the proof in the pudding.